Would you like to feel really confident that YOUR relationship will last? Many couples do more research into buying a house than ensuring their partner is the right one for them. And consequently, the house often ends up serving their needs far longer than the relationship ! 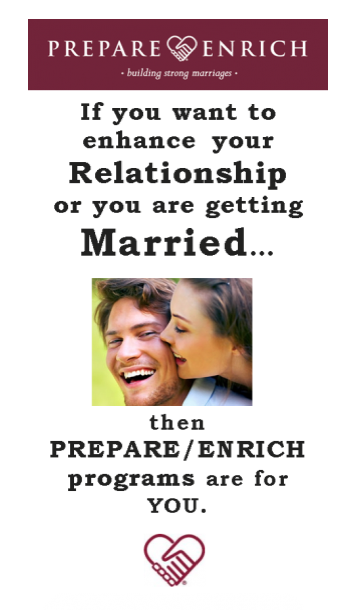 This scientifically validated Prepare-Enrich programme will give you total clarity on whether s/he is the right one for you, and ensure you both have the skills to communicate effectively and solve problems together. Imagine moving in together, or walking down the aisle with that sort of security! This coaching programme consists of 6 - 8 sessions of coaching. Before you start, you separately fill in 100 questions online - covering all the issues you may have to face as a couple living together. You then receive a 10 - 20 page report and will use this report during your coaching sessions. Couples who are thinking about becoming engaged, are engaged, or thinking about moving in together. 1. Your first session will involve having the program explained to you by your Relationship Coach.This also gives your partner a chance to meet me and decide if they want to work with me. You will also begin learning some of the essential Communication Skills for great relationships. 2. Shortly after your first session, you will separately receive an email that gives you all the instructions to fill in the PREPARE inventory online. This will provide a self-report description of your relationship. 3. Once your Relationship Coach has received the results of both your filled-in inventories, she will contact you to organise 6-8 sessions of 1.5 hours each. 4. You will also receive a 25 page workbook called ‘Building A Strong Marriage’ which is designed to help you to complete six exercises that are intended to complement the feedback dialogue being facilitated by your Relationship Coach. • You will need approximately 6-8 sessions of 1.5 - 2.0 hours each. And some people find that some extra sessions on top of this makes all the difference.